Size: Up to 7 feet or more. Growth Form: Shrub or arborescent plant; trunk short. Leaves: Leaves modified into spines or glochids and emerging from areoles. 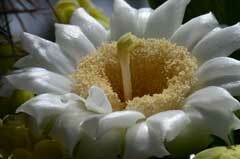 Flowering Season: May to June; Spring to early Summer. Elevation: 500 to 3,500 feet. Habitat Preferences: Sandy or gravelly soils. 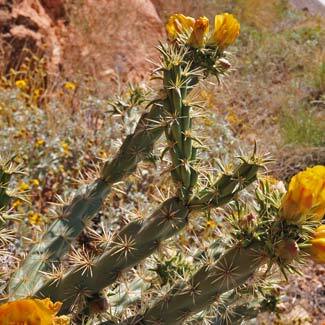 Recorded Range: In the United States Cylindropuntia acanthocarpa is found in AZ, CA, NV and UT. In Arizona it is found throughout the central and western parts of the state. AZ, CA, extreme southeast NV AND extreme southwest UT. 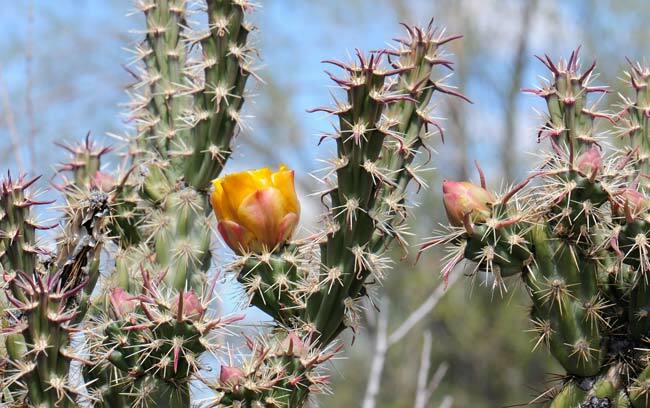 Threatened/Endangered Information: Opuntia acanthocarpa, Buckhorn Cholla is salvage restricted in Arizona. North America & US County Distribution Map for Cylindropuntia acanthocarpa. Cylindropuntia acanthocarpa var. thornberi, Pinkava Colorado Buckhorn Cholla (AZ). 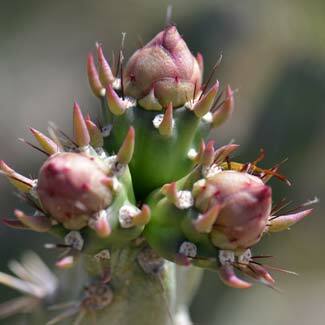 Comments: The type specimen for Cylindropuntia acanthocarpa is from Mohave County, Arizona. 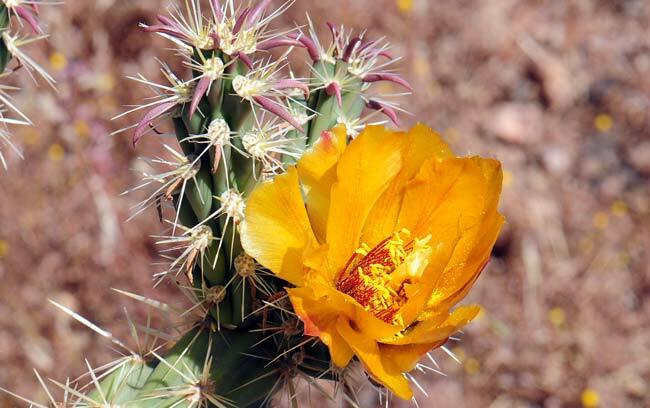 The author of Southwest Desert Flora is fortunate to have had the late Dr. Donald J. Pinkava as his professor, in 1972, for the course Flora of Arizona at Arizona State University, Tempe, Arizona. In Southwest Desert Flora also see: Arizona Pencil Cholla, Cylindropuntia arbuscula, Teddy Bear Cholla, Cylindropuntia bigelovii, Jumping Cholla, Cylindropuntia fulgida, Gander's Buckhorn Cholla, Cylindropuntia ganderi, Klein's Pencil Cactus, Cylindropuntia kleiniae Christmas Cactus, Cylindropuntia leptocaulis Walkingstick Cactus, Cylindropuntia spinosior and Baja Pencil Cholla, Cylindropuntia tesajo. 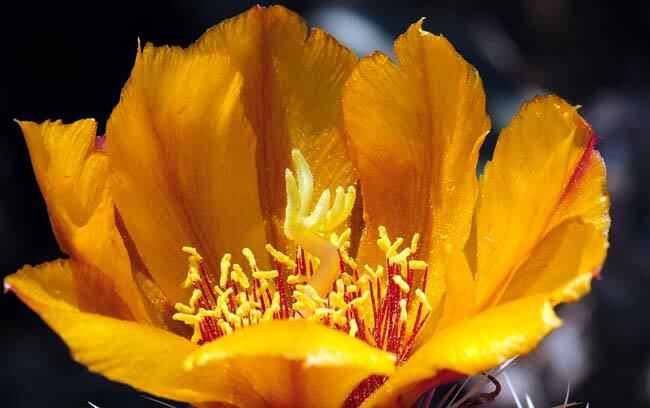 Arizona Flora, Kearney, Thomas H., Peebles, Robert H., 1960, University of California Press, Berkley and Los Angeles, California, as Opuntia acanthocarpa. Donald J. Pinkava, FNA | Family List | FNA Vol. 4 | Cactaceae| Page 94, 95, 102, 103 | Cylindropuntia | Flora of North America Editorial Committee, eds. 1993+. Flora of North America North of Mexico. 16+ vols. New York and Oxford. (accessed 07-Jun-2015).